Cocoon protein has been known as the most similar substance to human skin tissues in nature. ‘Serecin’ (the gum produced by the silkworm to bind the cocoon fiber together) forms a thin barrier on the skin to increase the ability of the skin to hold moisture, prevents skin damage and strengthens skin barrier function. 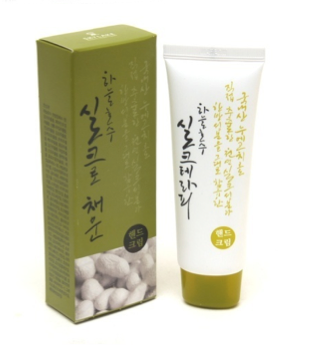 A highly concentrated, handmade body essence containing silk amino acids directly from domestic-grown silkworm cocoon. Natural aroma essencial oil; Grape fruits & Lemon oil make feel aroma therapy. This feels no sticky and no oily. Keep your hand silky soft and Protect from dehydration . 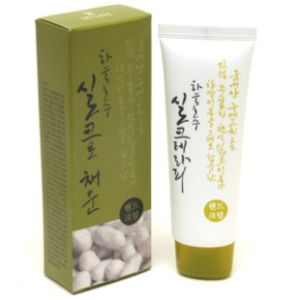 Be the first to review “Silk Chaeun Handcream” Click here to cancel reply.